← Am I “Doing It” Right? In the days after undergoing a biopsy to see whether a tumor taken from her breast was malignant, Audre Lorde examined her life. What she most regretted were her silences. Once she learned the tumor was benign, as a black lesbian poet she knew that she must begin working harder to transform silence into language and action. 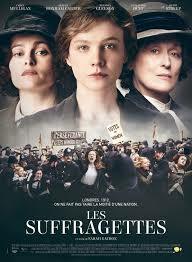 I thought of this as I read about the new film, “Suffragette,” starring Meryl Streep, Helena Bonham Carter, and Carey Mulligan. 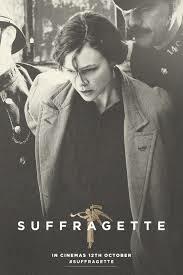 Maud Watts (Carey Mulligan) is an impoverished wife and mother who works in a sweatshop, receiving lower pay than her male coworkers. And the sexual harassment she faces from her boss is unrelenting. Ms. Watts silently endures, with no hope for the future. Unfortunately, we are taught to respect our fears over our needs, says Ms. Lorde. But when she loses everything, most importantly, legal rights to her son, she awakens to activisism. Most of us don’t face the level of punishment that Ms. Watts and her compatriots did. And yet we too often silently suffer blows and humiliations. We can sit in our corners forever while our sisters and ourselves are wasted, while our children are distorted and destroyed. We can sit in our safe corners, mute as bottles, and we will still be no less afraid. Posted on November 4, 2015, in feminism, LGBT+, psychology, sexism, violence against women, women and tagged Audre Lorde, Carey Mulligan, feminism, Helena Bonham Carter, LGBT+, Meryl Streep, psychology, sexism, Suffragette, women. Bookmark the permalink. 20 Comments. I think this article is telling a really powerful message to young girls especially, that we as women need to speak up and demand what we need! It doesn’t matter if it is something as big as equal rights in the workplace and salary, or something as small as simply speaking up in your relationship. I think women are programmed from a young age to not be too outspoken as it is not “ladylike” when in reality, the whole idea of being “ladylike” and “acting like a lady” is a load of bull that is extremely demeaning to women. I think many times women try to be respectful and not cross certain lines when trying to speak their minds, but the truth does not have boundaries and sometimes it is not respectful, and sometimes that it okay. Yes, it’s such a powerful message and I am so glad to share it. In your post you referenced the main character’s resistance to joining the women’s suffrage even in the face of opposition within her own personal life but she ultimately reached a breaking point. Andre reached a breaking point to. I think we all reach that breaking point where our silence is no longer worth that which it cost us. For Carey Mulligan’s character it was the loss of her son, for Audre Lorde it was facing death. It seems like for action to take place their must be deep personal root that tinkers along the scales and finally weights in as, too costly not to take action. But I also think of instances where, fear has cost people everything dear- with no resolve to find the warrior within. Thank you for sharing the wisdom of Audre Lorde with us and this movie, I’ll have to check it out. Did you enjoy it? A movie review I read made me think of Audre’s essay. I have yet to see the movie, but I am really looking forward to it. Wow what an incredible piece. We as women don’t think of how much women suffered to fight for our rights and how long this battle has existed. We disregard the fact that being able to go to school, work and vote, among other things are privileges only women within the past decades have been able to enjoy. If we stay quiet about the injustices we face or see we are only hurting ourselves. As a single mother I feel that I have been taken advantage of many times. First by men that I have dated, thinking that as a single mother I am in desperate need for a man to support me and father my daughter. Next at work, they know that I need my employment to support my child and no matter how demeaning some jobs are I will keep doing it to support ourselves. Finally at school, I feel that once a professor knows I am a mother they immediately assume that my work will lack the attention other students can give, thus provide me less help. As Ms. Lorde states if we sit in our corners, quietly without saying a word we will continue being afraid, but if we stand up and fight for the injustices anything can happen. I think it’s very alarming to think about all the concessions I’ve had to make, or the “tyrannies I’ve had to swallow”. Like Audre Lorde, I’ve remained silent and regretted it. I’ve been in environments where I have been talked down by men (who were older and had power over my education and career) for just merely suggesting that feminism was still needed. I was too afraid to argue, mostly for the career and place in the lab. I already sensed that being one of the few young woman in lab full of men that I was already slightly removed from them, and I didn’t want to make it worse or to highlight my difference. “We are taught to respect our fears over our needs.” How chilling and accurate. I haven’t watched the movie but I saw the controversy over the “I’d rather be a rebel than a slave”, which in my opinion was in poor taste. It’s interesting that we are often more offended by women who complain about sexism than about sexist behavior. Thanks for sharing. Thanks for your thoughts. And yes, I hope so! But I imagine that there’ll always be something that we all need to awaken to in terms of our personal empowerment. It’s kind of sad that all of those rights you’ve listed are still being fought for today. It’s important to keep our voices being heard. I had an aha moment a few years back when I realized that by allowing the status quo to keep me small and silent, I wasn’t just harming myself but continuing to pave the way for more generations of women to keep living this way. I also realized that I wasn’t any better off staying suppressed- it’s not like I got rich or found the right relationship or whatever else from playing by the rules of patriarchy. I am still buoyed by these words. I’ve even been going through something in the last few days where these words have given me strength. having had cancer last year and just had a biopsy on a breast lump more recently, this article really hit home… I have decided that my works need publication – I am going to self-publish them! I’m so glad that Audrey and this post can help to make a positive difference in someone’s life. I wish you – so much – well! Those words had a really big affect on me when I first heard them. I’m happy to have the opportunity to share! Thank you. I love this “We will be harmed whether we speak or not, so we might as well speak.” So true! Do you think that part of the fear these days is women speaking up are then condemned by other women? A couple of Hollywood actresses come to mind. For sure Women speaking up can find condemnation from women and men, alike. When you live in a patriarchal society (a society that privileges men and masculinity)everyone unconsciously internalizes patriarchy to some degree – even me. So women who are strong and speak out can’t seem threatening. The only way to overcome that is to keep speaking out until it becomes normal. When Bill Clinton ran for president in 1992 people were much more uncomfortable with Hillary’s power than they are now — even though she has a lot more power now. We’ve come a long way, but we still have a long way to go.